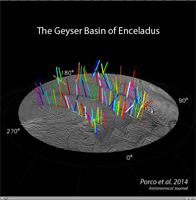 This graphic shows a 3-D model of 98 geysers whose source locations and tilts were found in a Cassini imaging survey of Enceladus' south polar terrain by the method of triangulation. While some jets are strongly tilted, it is clear the jets on average lie in four distinct "planes" that are normal to the surface at their source location. Dotted vectors indicate five jets whose sources were determined from images acquired too closely in time to determine tilts accurately. Consequently their 3-D configuration has a large uncertainty associated with it. Two geysers, indicated by crosses in PIA17188, have no tilt determinations at all and are not shown here. A movie showing a 360-degree view of this model is also presented here. The still graphic and the movie illustrate some of the findings reported in a paper by Porco, DiNino, and Nimmo, and published in the online version of the Astronomical Journal in July 2014: http://dx.doi.org/10.1088/0004-6256/148/3/46. .
Post-equinox images like this, clearly showing the different projected locations of the intersection between the shadow and the curtain of jets from each fracture, were useful for scientists in checking the triangulated positions of the geysers, as described in a paper by Porco, DiNino, and Nimmo, and published in the online version of the Astronomical Journal in July 2014: http://dx.doi.org/10.1088/0004-6256/148/3/45. A companion paper, by Nimmo et al. is available at: http://dx.doi.org/10.1088/0004-6256/148/3/46. The Cassini-Huygens mission is a cooperative project of NASA, the European Space Agency and the Italian Space Agency. NASA's Jet Propulsion Laboratory, a division of the California Institute of Technology in Pasadena, manages the mission for NASA's Science Mission Directorate, Washington. The Cassini orbiter and its two onboard cameras were designed, developed and assembled at JPL. The imaging operations center is based at the Space Science Institute in Boulder, Colorado.